Head of Water Authority, Eng. 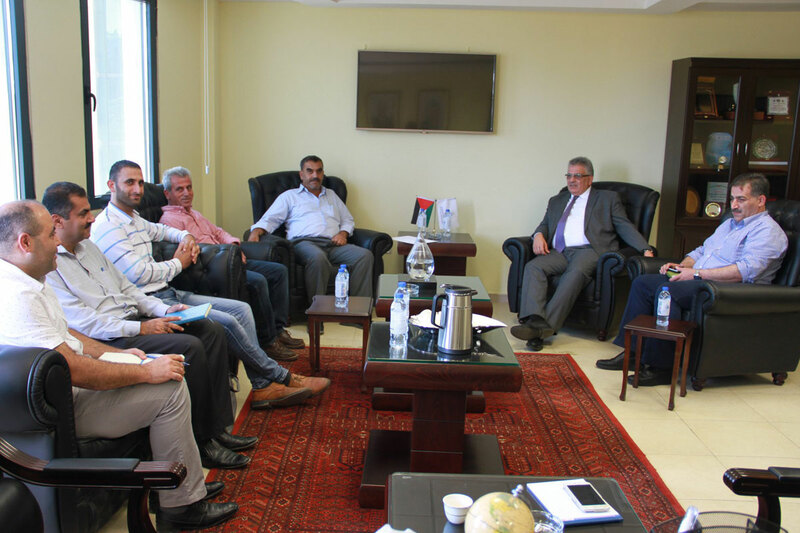 Mazen Ghoneim, discussed today the needs of Kafr Sur and Jayyous towns, during a meeting with them in two separate meetings, which are related to increasing the quantities of water to meet the growing needs and providing water projects to improving the water situation in both towns. The needs of Kafr Sur focused on establishing a water tank with a capacity of 500 m3, which will contribute to the provision of water quantities as well as to help them to build a water pipeline to improve and sustain water pump where the municipality has allocated land for the project. Where the needs of Jayyus focused on solving the pump problem so that the people of the region get the water quota allocated to them because the capacity of the current pump is weak and thus exacerbate the problem of Jayyus in the water in addition to the need to create a new water tank instead of the current tank. For his part, Minister Ghoneim said that these demands will be studied technically and financially by the competent teams and that the Water Authority will work to include the needs within the priorities and in the budget of the projects next year to solve the problem of these areas, in addition to instructing the technical staff to study the status of the pump quickly and urgently to raise the amount of water supplied to the town and solve the existing problems.